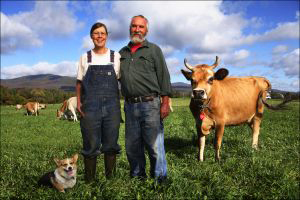 Butterworks Farm is located in Westfield, VT.
Butterworks Farm is an organic Vermont dairy farm that has been making quality dairy products since 1979. They produce a full line of exceptional cultured dairy products year round: Whole milk, nonfat and maple sweetened yogurts, nonfat cultured buttermilk, and reduced fat kefir in maple and plain. They use only high quality Jersey cow milk and live cultures, and they never use thickeners. Their yogurt's excellent quality and fine flavor is attributed to the protein-rich milk of their Jersey cows. To ensure a premium product, they've kept their animals, all born and raised on the farm, healthy without antibiotics or hormones. These Divine Bovines feed on the nutrient-dense pasture, hay, and grains sweetened by the optimal tilth and life of their soils. We're proud to partner with Butterworks Farm to bring you great tasting organic yogurt from right around the corner in Vermont!